Observation - Oar Weed - UK and Ireland. Description: Annual emptying of Thanet's largest tidal pool (at low tide end would be 5m) Found in sublittoral, submerged probably most of the time here, when the sluice gates are shut. A great example of growing kelp and it's holdfast. Annual emptying of Thanet's largest tidal pool (at low tide end would be 5m) Found in sublittoral, submerged probably most of the time here, when the sluice gates are shut. 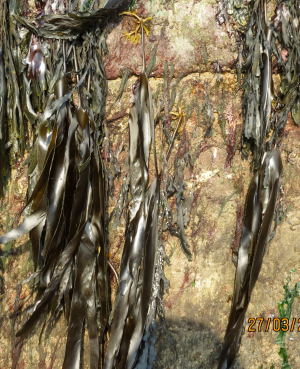 A great example of growing kelp and it's holdfast.